I am so excited to share with you my latest sensory play recipe! 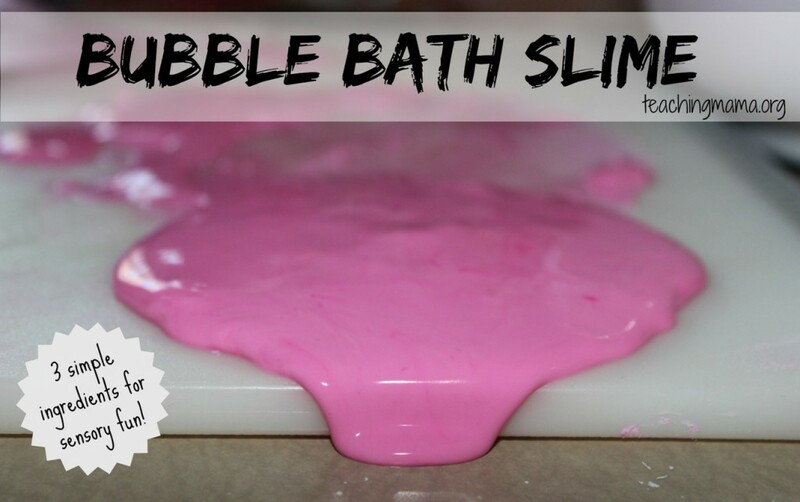 I used just a few ingredients to create Bubble Bath Slime! 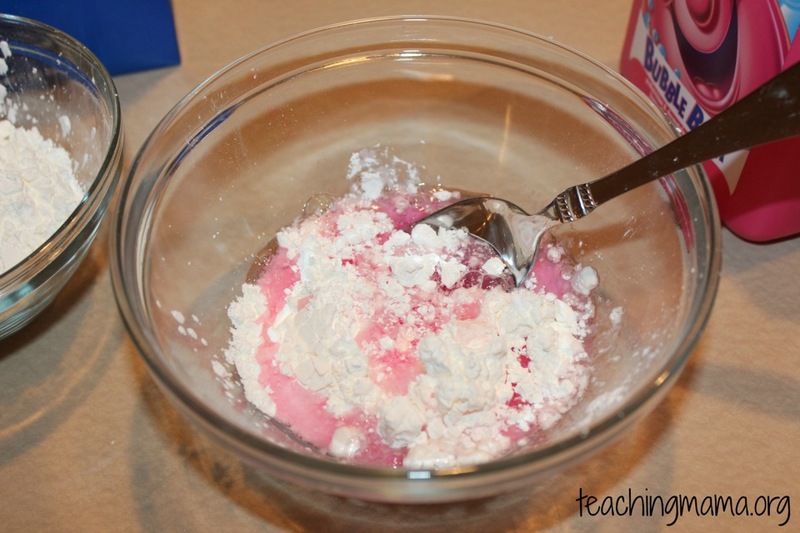 This sensory activity will have you wondering whether it‘s a solid or a liquid. 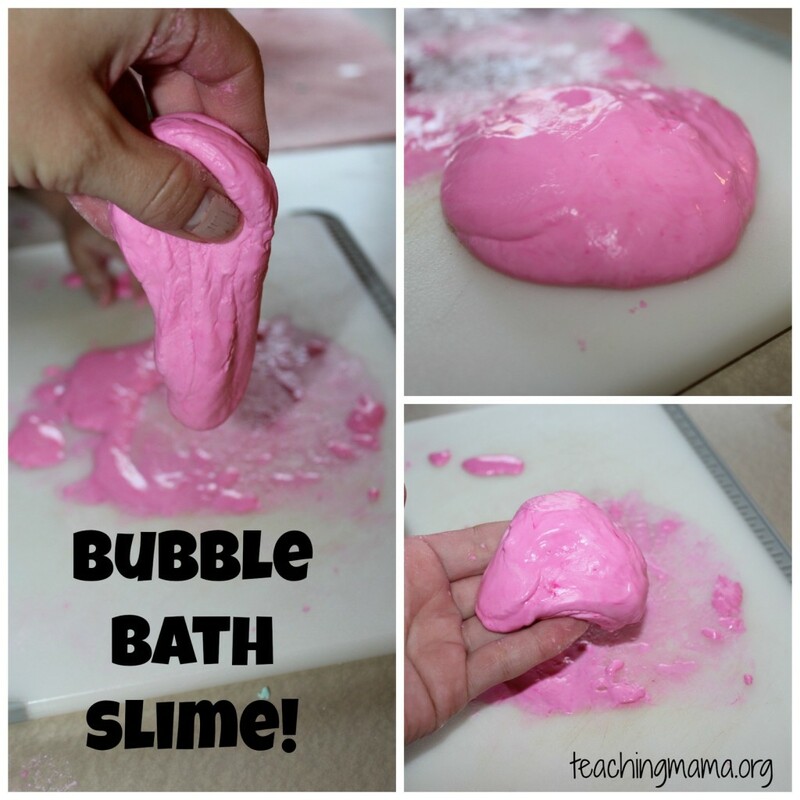 It‘s slimy, yet can be formed into a ball and be molded. It is SO fun! 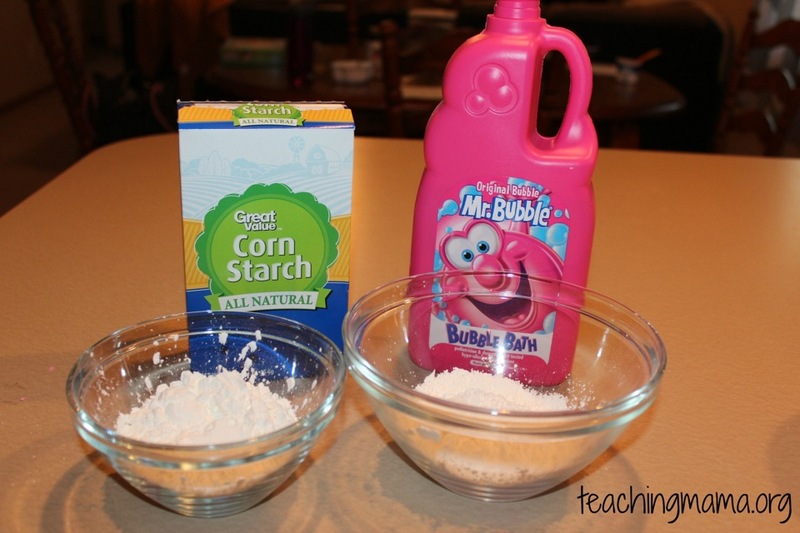 Start by pouring the corn starch into a bowl. Mix in the 2 tablespoons of water. Then add a few drops of food coloring (optional). Lastly, mix in 2 tablespoons of bubble bath. 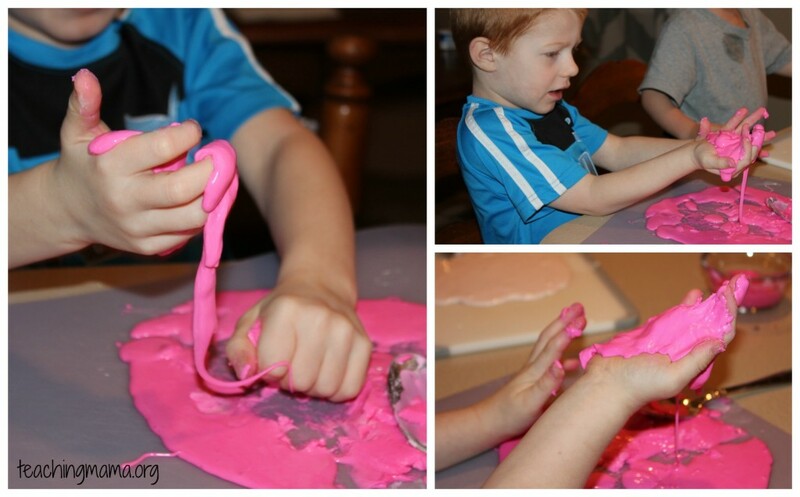 Keep mixing until the slime no longer sticks to your spoon or fingers. If it is still sticky, add in 1 or 2 tablespoons more corn starch. It may be slightly sticky, but if you can pick it up without it sticking all over your hands, then it is ready. I made this recipe over a dozen times making sure the recipe was perfected. These measurements worked the best for me. I did not try it with another brand of bubble bath, so it may turn out slightly different if you use a different kind of bubble bath. 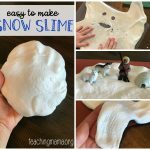 Then place it on mats and have your kids explore the slime! My toddler was a little hesitant to touch it with his fingers at first! This batch we made was very slimy and goopy. 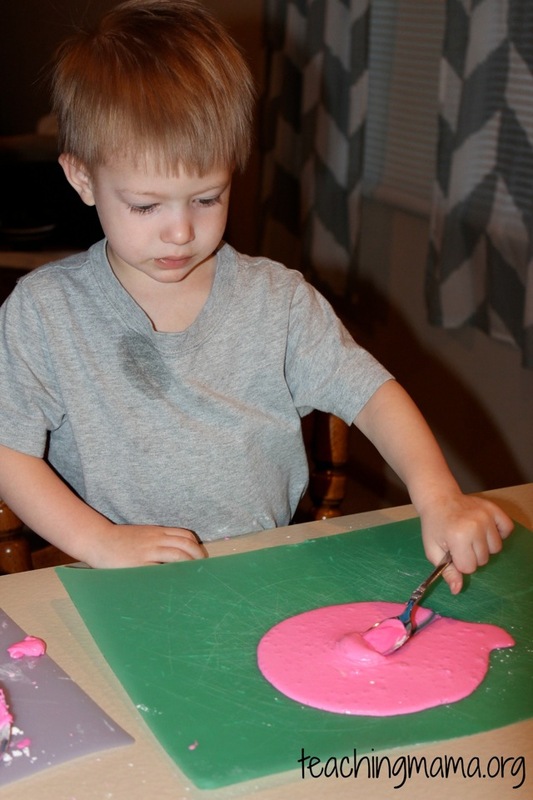 It was so similar to oobleck because it looks like a liquid on the mat and it drips down through your fingers, but if you keep molding it with your hands, it feels like a solid. So neat! Also, have I mentioned how AWESOME this smells?! It smells just like bubble bath! 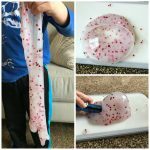 The following slime is a little lighter in color because I used less food coloring. I actually found it therapeutic to play with! Wes loved placing his hands on the slime, then taking them off to see his handprint! 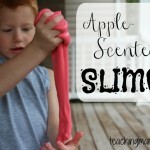 There are so many ways to play with this slime! I did not save the bubble bath slime after we played with it. I found that if I let it sit out, it dried out easily, so I decided to discard it after we played with it. Do not pour it down the drain. The corn starch can clog your drain. Instead, scrape off your mats and bowls into the trash before washing. Wash your dishes by hand. I found out the hard way not to use your dishwasher. 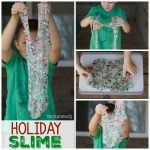 Since bubble bath is an ingredient in this recipe, it made too many bubbles in my dishwasher and started leaking bubbles onto my kitchen floor! Kind of funny, but I don‘t want you to experience that! So just wash your dishes by hand. 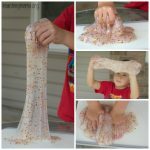 If you decide to make this, please make sure your little one does not put things in their mouths since bubble bath is an ingredient. 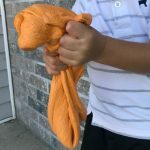 I hope you‘ll try this fun sensory play recipe out! Let me know how it turns out for you! It is to play with on the counter, not in the bath tub.